Addressing Bicycle-Vehicle Conflicts with Alternate Signal Control Strategies, published in April 2018, is the first study to explore bicycle signal control strategies for addressing bicycle-vehicle conflicts. This study analyzed the operational impacts of traditional concurrent phasing, leading bike intervals (LBI), split leading bike intervals, and exclusive bike phasing in a microsimulation environment, and explored the safety impacts of traditional concurrent phasing, leading bike intervals, split leading bike intervals, and mixing zones using video-based conflict analysis. The microsimulation analysis revealed increased delays due to LBI, split LBI and exclusive bike phasing for the affected motor vehicle phases compared to traditional concurrent phasing. Using post-encroachment time (PET), a surrogate safety measure, conflicts between turning vehicles and bicyclists were investigated. While the split LBI treatment was useful in mitigating conflicts during the lead interval, the risk for bicyclists is shifted to the stale green portion of the phase. No correlations were found between the frequency of conflicts and elapsed time since green. With the mixing zone treatment, significant confusion was exhibited by both cyclists and drivers, with respect to the correct action to be taken. Observation also revealed that a significant percentage of the vehicles merged into the mixing zone at the very last second, thus adding to the confusion. This study provides broad-based recommendations on the appropriate treatment to be implemented to reduce right-hook conflicts. Identify specific signal timing strategies to reduce "right hook" conflicts between bicyclists and turning vehicles. Sirisha Kothuri, Ph.D. is a senior research associate in the Department of Civil and Environmental Engineering at Portland State University. Dr. Kothuri’s primary research interests are in the areas of multimodal traffic operations, bicycle and pedestrian counting, and safety. 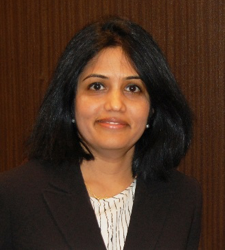 Dr. Kothuri is the research co-chair of the Transportation Research Board’s Pedestrians Committee (ANF10) and the Bicycle and Pedestrian Data Subcommittee (ABJ 35(3)) and a member of Traffic Signal Systems committee. Dr. Kothuri received her BCE from Osmania University, India, MSCE from Louisiana State University, Baton Rouge and Ph.D. from Portland State University. This 60-minute webinar is eligible for 1 hour of professional development credit for AICP (see our provider summary). We provide an electronic attendance certificate for other types of certification maintenance. Sign up for our newsletter to get updates on our events.